Anyone who has read this blog for any time at all knows that The Legal Genealogist is a huge fan of the Preserve the Pensions project — the effort spearheaded by the Federation of Genealogical Societies to digitize the pension records from the War of 1812. But it’s a war that most Americans don’t know very much about. But many of us need to know more, because, we’ve discovered, an ancestor fought in that war, or our family — in America, in Canada, in the UK or elsewhere — was impacted by it. And now there’s a way to find out more, free, explaining both the war in brief and these amazing records — the pension records of the war held by the U.S. National Archives. 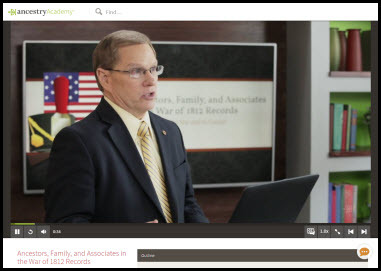 There’s a free course now online from Ancestry Academy. Taught by David Rencher, this new video course is entitled Ancestors, Family, and Associates in the War of 1812 Records and — like the pension records being digitized — it is and will be free, forever. The War of 1812 was America’s ‘Second Revolution’ – little understood by many in America how precarious the survival of the new nation was. This segment enlarges the student’s understanding of the causes of the war and how the Napoleonic War on Europe’s continent distracting the British military may very well have saved the nation. Ending in 1815 with the ratification of the Treaty of Ghent, the war directly led to the penning of our nation’s national anthem, The Star Spangled Banner and propelled Battle of New Orleans’ famous General Andrew Jackson to the Presidency of the United States, serving as its seventh president. To place an ancestor in the context of history, this segment paints the landscape of the social climate during the War’s four year course – 1812 to 1815. Kudos to David for a great course, and to Ancestry Academy for producing and hosting it, free.